Time to pull out that sword that has been collecting dust for years - the Samurai Sevens need your help. Click here to play! There is plenty at stake, and even more on offer if you manage to spin up the best winning combinations. 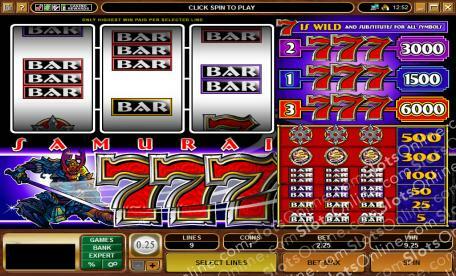 Samurai Sevens is an exciting 3-reel slot played across 3 pay lines, and allows three coins to be played at any one time. The traditional elements of the slot are kept secure, with only a single Wild symbol in play. The Seven symbol is Wild and can be substituted for any other symbol on the reels in order to complete a winning combination. Depending on where you spin them up, the Sevens will pay out quite well; if you land all three symbols on the third active pay line, you will be paid out up to 6000 times your initial wager! Will you rejoin your Samurai kinsmen for glory and riches? The Seven symbol is Wild and can be substituted for every other symbol to complete winning combos.